Through Executive Order #80, Governor Cooper establishes “bold new steps” that invest in North Carolina’s clean energy future and prioritize the role of building energy efficiency in state government. Reduce statewide greenhouse emissions 40 percent below 2005 levels. Increase the number of registered zero-emission vehicles to at least 80,000. Reduce energy consumption in state-owned buildings by 40 percent. 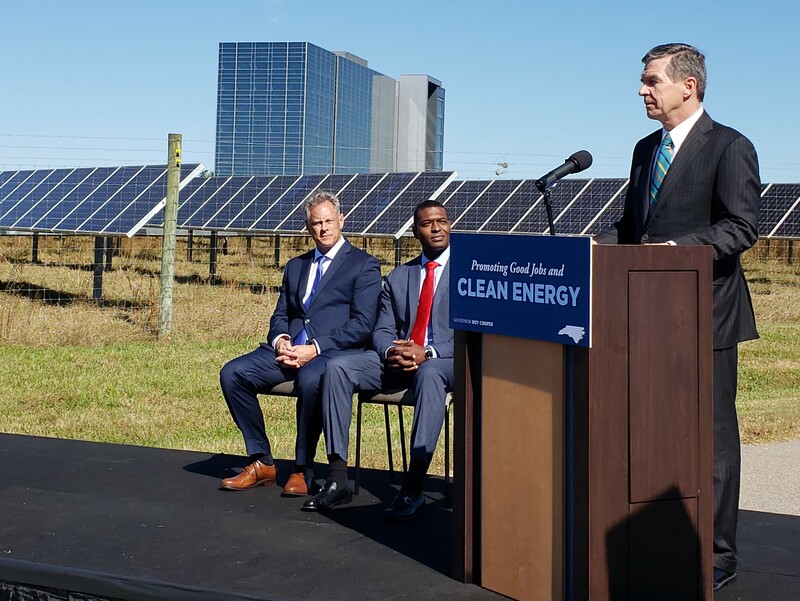 Backdropped by a solar farm and a LEED-certified building, Governor Cooper established a lead-by-example approach for state agencies to lead North Carolina’s transition to a clean energy economy that realizes the economic development, job creation and environmental benefits garnered by increased investment in clean energy and building energy efficiency. North Carolina Building Performance Association (NCBPA) applauds the Governor’s leadership. In addition to the three primary targets, the Executive Order initiates a process to develop a North Carolina Clean Energy Plan, a vital resource that public and private interests have been missing for years. This step is a key recommendation in NCBPA’s recent Energy Efficiency Potential Report, which showed how increased investment in building energy efficiency will create more jobs, more economic development and more environmental benefits than any other form of energy investment available. Governor Cooper proclaiming November 5th as “Energy Efficiency Day” in North Carolina (link). Improving energy efficiency requirements in North Carolina’s building and energy codes (link). Prioritizing building energy efficiency in North Carolina’s state energy planning (link). Working with industry companies to create workforce development resources (link). Improving energy efficiency and performance standards in affordable housing (link). How will you support our industry in 2019? NCBPA Seeks New Board Members for 2019!